One day, I went to get my hair done at a popular “upper scale” salon that shall remain nameless for the purposes of this blog (If you ask me in person, I’ll tell you all about it). I looked great. She cut my hair the exact length, she offered the perfect amount of pointless conversation to take my attention off her strangely applied eyeliner, and I walked up to the counter feeling spiffed up and ready for the rest of my day. She, extending the camaraderie (or so I thought), walked with me, chatted with the cheery receptionist, and commenced to pull bottles off the shelves. She placed them in front of me, “you’re gonna’ love how easy this style is to maintain.” She waved at the clerk and bounced off to her next victim client. And there I stood; buying bottles of junk I didn’t want. I walked to my car, convincing myself I had not just been duped, but I knew better. She employed a tactic that worked on me, and probably a lot of other people as well. You know the one. It’s the one where the customer unwittingly buys a bunch of stuff they didn't plan on buying. Last week, I was talking to another contractor who had recently lost a bid to a competitor. The competitor bid low and planned to make up the difference in change orders. It’s sad to say, but this is a standard practice for many builders. Unfortunately, clients don’t talk about it much, because no one likes to admit they feel cheated. After I got my hair cut, my friends all complimented me. Do you think I told them the truth about my experience? No way. I told them the name of the stylist and pretended like her up-sale at the end of the transaction was normal. But it wasn’t. And it didn’t have to be. If she wanted to style my hair in a way so I would have to buy bottles of goo, she should have told me, and I would have probably been on board – maybe even excited about the change. I definitely would not be writing this blog. The fact is every sales transaction involves a level of trust. I will not return to that stylist. Not because my bill was too much, but because of the surprise at the end of the process. In essence, no matter how good the cut was, I do not trust her to work in my best interest. So what about contractors who work with this surprise at the end philosophy, and do so successfully? Why do they get away with it? Why do people still use that styling salon? It goes back to not wanting to be the person who was taken advantage of. As contractors, this is frustrating. We are professional, we know how much something costs, and to have another “professional” under-bid to get the homeowner to sign the bottom line is just plain dishonest. But, there is little we as contractors can do about it. However, there is a lot you, as a customer, can do. -How many change orders were there in total? -What was the dollar amount of change orders? -What was the reason for the change orders? -How much did you spend on your home outside of your construction loan? -Were the contractor’s allowances realistic for your goals? -Did your appliances go over your allowance? -Did your flooring go over your allowance? -Did your landscape go over your allowance? -Did your lighting selections stay within the allowance? -Was the decorating and painting budget sufficient? -Did you feel like you had the option to reject change orders, or did you feel forced into them? -After you reflected on the allowances you were given, did you feel like they met your original expectations? A $50.00 haircut is not exactly what I would call low cost, but it still was a lot less than I ended up paying for the privilege of the experience. How much will you pay for your experience? Has your builder earned your trust? We pride ourselves on our honest approach, and yes, sometimes our numbers might sound a bit high. That’s because we will bid what you ask for and nothing less. If you want an expensive faucet, you will find it in your bid, and not buried in an allowance that does not get close enough to paying for it. On the flip side, if it turns out to be more than you wanted to spend, we will help you trim your budget in a way that will not come back to bite you in the end. Working with unrealistic allowances cheats the homeowner, the builder, and everyone involved. At Degnan Design Builders, we design to your budget. That means you have to power to control your costs, and can be assured we will not suddenly raise prices at the end of the transaction and leave you walking to your car, wondering what just happened, and why your $50.00 haircut turned into a $100.00 experience. Oh, and ask me for the name of my new stylist…she’s fantastic. 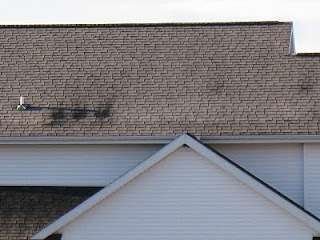 If you look out your window in the morning and see this on the neighbor’s roof, you know something is not quite up to par with their home’s energy efficiency. Besides causing you to wonder if your own roof has tell-tale spots (you may want to put on your robe and take a look while the frost is still on the roof, or better yet, ask your neighbor what they can see over their morning cup of coffee), signs like these reveal the lack of knowledge that homeowners, and even many builders, have in regards to performance expectations. 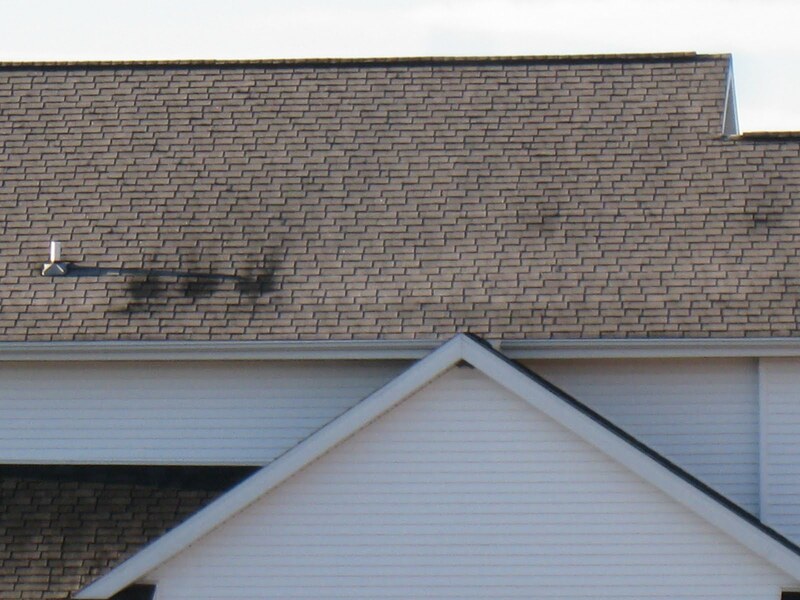 The dark spots on the left side of this picture reveal areas where heat from inside the house has escaped to melt the frost off the shingles. This is concerning for three reasons. The first is the potential of ice damming and the resulting damage. 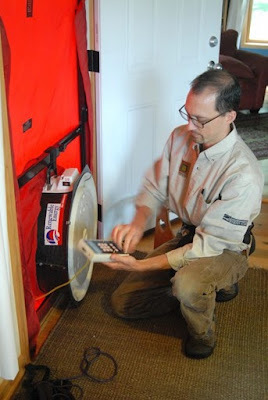 The second is the transfer of heat to the outdoors, which reduces efficiency and increases utility bills. The third, and possibly most concerning, is the evidence that for this home, energy efficiency may have been an afterthought, and along with the keys, the homeowners may have purchased an abundance of missed opportunities and unrealized potential savings. Last week, I (Cara) crawled into an attic with Anthony as he taught some local maintenance technicians how to make their apartments more efficient. Going into the project, I thought I knew a fair amount about building with efficiency in mind. What I learned, however, is unless efficiency is a priority of the builder, it simply does not exist. The spots on the roof should not be there. They are easily preventable, and planning their prevention, or in this case, their correction, is essential to a well performing structure. 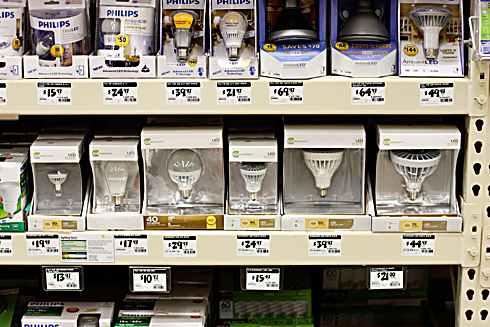 Over the next few weeks, we will work to demystify energy efficiency. We will describe what the term means, the modern expectations for an energy efficient home, and how these expectations are realized. Watch our upcoming blogs for hints on how to make your home more efficient, including a list of projects, some approximate costs, what improvements can give you the most bang for your buck, and advice on what you may or may not want to tackle on your own. Every time I surf through the home building networks on TV, I seem to run into a “man cave” episode. So, with my curiosity piqued (and ignoring the potentially sexist implications), I decided to fire up the search engine and type it in. One website, boasting the best of the best, caught my eye and I found myself scrolling through photos of rooms that look like hotel fantasy suites minus the hot tub. Star Wars rooms (including a life size 3CPO), and Star Trek rooms (let’s not get the two confused), popped up on the screen. The website promoted theater rooms with walls textured like an actual cave, garages with wet bars, spaces designed to look like a NFL locker room, and even a room built around a pole (yes…you know the kind). After the initial smirk and eye roll, I was impressed by the detail that went into these spaces, and especially the level of craftsmanship displayed. After all, taking a basement block wall and turning it into the Starship Enterprise, and doing it well, is not an easy task. There’s electrical to run (a lot of it for those control panels), and plumbing for the wet bar (where was that on the bridge? ), and a good deal of well planned audio and visual equipment. In short, design and planning cannot be taken lightly for a well done “man cave." If you have dreams of a “man cave” of your own, and you want it to be a place you are proud to invite your like-minded friends, give us a call. We will make sure your space consists of more than a big screen hanging on a painted block wall, attached to a giant orange extension cord running the perimeter of the room. In all seriousness, we would design it so every square foot is utilized to its fullest potential. Non-standard lighting choices, the perfect fixtures, and carefully selected flooring all influence the comfort of your “man cave”. We could even create a wet bar in the place where the replicator should be (as we have not perfected that yet). Or, add that fantasy suite hot tub back in. Of course, if you are looking for a room that blends with the rest of your decor, we could design that as well, paying close attention to the details that will make your remodel or addition feel seamless and comfortable. Are you ready to save $25,000 building your new home? We have 2 different homes, 2 different lots, and 2 different price ranges -- ready to go, both with $25,000 in Parade of Homes savings and ready to occupy after the Parade of Homes in June 2011. If you are ready for your dream ranch, with an open floor plan, great room, 2 fireplaces and room for everyone, see Lot 35 Rivers Turn. There are 4 bedrooms, views to die for, and a garage that you just won't believe -- room for 6 cars, or all your toys! Quit paying storage fees for your boat or hobbies and buy this home. Entertain in the open great room and kitchen, enjoy holiday dinners in a semi-formal dining room that is still comfortable for your weekday dinner. A 1/2 acre lot with a private back yard leads you to the Yahara River conservancy -- and no back yard neighbors! Notice 3 sets of patio doors that connect you to that back yard. Views from every part of the house -- even across the street there are no homes. Looking for an open 2-story plan at a modest budget? Then Lot 66 Rivers Turn is for you. We have options to build with 3 or 4 bedrooms, and it has an exposed basement for future finishing. On the main level, find a REAL mudroom with room for all your stuff, a home office, and living room with a fireplace that is open to the kitchen and dining area. Windows make the difference -- take in views of the conservancy from your large living room and master bedrooms. Notice the large 10 foot patio door off the dining area. And again, a 3 car garage with extra depth to store the fun things every family has! With Degnan Design Builders, the differences are in the details and in the design. Our homes are tested to prove their energy efficiency using Home Performance with ENERGY STAR and the Focus on Energy New Homes Program. What were your heating bills this winter? In my own home, the most expensive month this year is $133, including our heat, hot water and a gas dryer used for 5 family members in a 2800 square foot home. Thanks to the Intelligent Wall construction methods, we can produce the same results for you. For more information, you can call Abe at 846-5963, or Ted & Tammy Krez at Lakewood Realty.